Some Georgia legislators have proposed increasing cigarette taxes from 37 cents to $1.37 as a way to help close the state’s projected $1 billion deficit-the result of an over 12 percent drop in tax collections from last year. Like other states, Georgia is struggling fiscally during times of decreased consumer spending and increased demand for state services. And as in other states, legislators are looking for products to tax as a way to balance the budget. The $1 cigarette tax increase is supposed to raise an additional $354 million per year from smokers. Advocates of such a drastic cigarette tax increase should consider its consequences and basis in sound public policy. A dollar increase in Georgia’s cigarette tax would increase the incentive for border shopping from Georgia’s relatively low-tobacco-taxed neighbors as well as cigarette smuggling. The tax itself throws the burden of state financing on one unlucky group of taxpayers, smokers—a demographic in which lower-income individuals are overrepresented. Raising cigarette taxes has proven popular for states during this recession, but that does not mean Georgia should follow. Georgia should resist the temptation of cigarette tax increases. 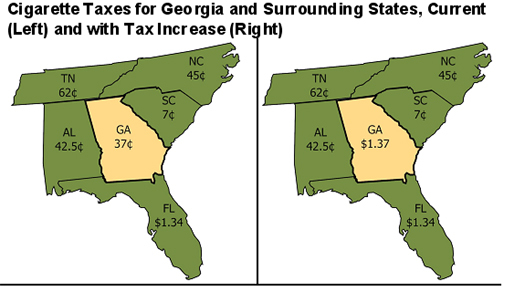 Looking at Georgia and the neighboring states’ cigarette taxes (see map), it is obvious that a $1 per pack increase will put the state at a comparative disadvantage for cigarette sales. Georgia will have higher rates than all its neighbors. This might lead to lower-than-expected tax revenue for the state and provide incentives for criminals-rather than the state-to profit from Georgia’s high-priced cigarettes. Border shopping has not been uncommon with tobacco products, especially since the flurry of state tobacco tax increases during the recession. After Washington, D.C. increased its cigarette tax from $2.00 to $2.50 to close a budget hole in FY 2010, it raised lower-than-expected revenue, likely due to Maryland, Virginia, and D.C. smokers’ shopping outside the District. A report by the Chief Financial Officer of the District of Columbia states: “Given that cigarette tax rates in neighboring jurisdictions are now lower than that of the District, future increases in the tax rate will likely generate less revenue rather than more.”  Last year, Arkansas legislators were so worried about losing revenue to other states after a cigarette tax increase—59 cents to $1.15—that they added a provision setting Arkansas border town tobacco taxes equal to the taxes just across the border, plus 3 cents. Of course the extent to which smokers shop in bordering states is a function of the price difference of the product and the cost of transportation across state lines. States with small land areas or large border populations would predictably be most susceptible. While those living in Atlanta do not have the same cross-border shopping opportunities as those in D.C., Georgia borders several low-cigarette-tax states, including South Carolina, which has the lowest rate in the country at 7 cents. It is predictable that such a price differential between Georgia and South Carolina, or even between Georgia and Alabama with a 42.5 cent tax, would make it worthwhile for those who live near state lines to shop outside Georgia. That makes the tax supporters’ estimates of added revenue somewhat unpredictable, as was the case in Washington. And one might not need to drive to another state to buy less-taxed cigarettes. If you Google “cheap cigarettes,” you’ll see pages of websites dedicated to helping smokers skirt their areas’ burdensome tobacco taxes. Today states compete not just with other states for tobacco revenue but with online duty-free dealers. States are also competing with criminals. Relatively high cigarette prices provide incentives for the creation of cigarette black markets and smuggling, pushing a fairly innocent but unhealthy habit into the criminal realm. It was reported recently that states lose about $5 billion a year to smuggling, and this region has been acquainted with cigarette smuggling in the past: Florida has a history of having one of the highest cigarette taxes in the country as well as a black-market problem comparable to that found in New York. Faced with a budget problem that affects the entire state—and is not caused by smokers—what is the justification for government to lean on this segment of the population to fill its coffers? Smokers are an easy tax target for politicians because of their unpopularity. And Georgia smokers, like those in many other states, recently have found themselves the focus of a convergence of interest groups in which the motives of health advocates and revenue seekers happen to overlap. Last year 15 states, the District of Columbia, Puerto Rico, and the federal government increased their cigarette taxes. It is unlikely that so many legislators had a burst of concern over smokers’ health. But desperate need of revenue, along with the ever present paternalistic concern over health, has emboldened lawmakers. Health concerns, while appropriate for individual smokers to consider, should not be a matter for public policy as long as the costs of smoking are private. When citing health costs of smokers in the state, advocates of tobacco taxes are not likely to distinguish between public and private costs. That may be because the costs imposed on society by smokers are either nonexistent or highly exaggerated. Cigarette taxes are also regressive—like all consumption taxes—because the poor spend a larger percentage of their income than the wealthy on any item they purchase. But Georgia’s cigarette taxes also provide the poor and wealthy with different levels of government services. In a Tax Foundation Fiscal Fact, Chief Economist Patrick Fleenor notes: “We can safely conclude that the cigarette tax transfers funds from areas with high smoking rates to those with low smoking rates…. Moreover, in Georgia, they tend to shift income from low- to relatively high-income areas.” Low-income residents, while bearing the cost of the tax, will likely not receive the benefit. Georgia should not target smokers to fill a budget hole. A $1 tax increase will give Georgia the highest cigarette tax in the region-incentivizing shopping either outside of Georgia’s borders or on the black market inside the state. It would be regressive in taxation and in distribution of public services. Mark Robyn, “Border Zone Cigarette Taxation: Arkansas’s Novel Solution to the Border Shopping Problem,” Tax Foundation Fiscal Fact No. 168, April 9, 2009, http://www.taxfoundation.org/legacy/show/24599.html. Gary Fields, “States Go to War on Cigarette Smuggling,” Wall Street Journal, July 20, 2009, http://online.wsj.com/article/SB124804682785163691.html. Patrick Fleenor, “Give police a break: Leave the cigarette tax alone,” Tax Foundation commentary, Dec. 11, 2008, http://www.taxfoundation.org/legacy/show/24041.html. Joseph Henchman, “A Review of Significant State Tax Changes During 2009,” Tax Foundation Fiscal Fact No. 204, December 21, 2009, http://www.taxfoundation.org/legacy/show/25641.html. For a good summary, see Robert E. McCormick, Robert Tollison, and Richard E. Wagner, “Smoking, Insurance, and Social Cost,” Regulation, Cato Institute, Summer 1997, http://www.cato.org/pubs/regulation/regv20n3/reg20n3e.pdf. Patrick Fleenor, “Georgia Tobacco Tax Favors High-Income Counties,” Tax Foundation Fiscal Fact No. 211, February 18, 2010, http://www.taxfoundation.org/legacy/show/25864.html.